Edding 3000 on cardboard, Jesus Distilleries, Wien, Fin-de-Augustus. a no-discount no-changes no-return ticket back to Amsterdam expired by 2 weeks. no change, no return, 1200 kilometers. for 20th century hippies, there are some things money can not buy in a world where "mind", not money, equals mobility. Some stormy days, you will notice the parting of the clouds at a place called Bad Reichenhall, a former frontier town outside Salzburg. 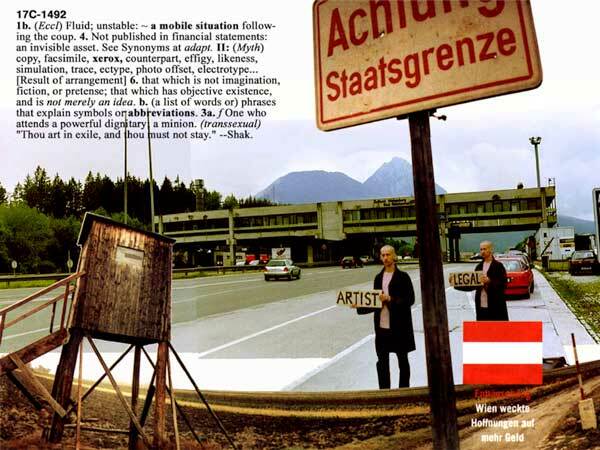 in 2001, somewhere between Seattle and Genua on the anti-globalisation scale, consensus Austria is lost, again, in a xenophobic Osterweiterung-Überfremdungsangst. a stranger attired in post-Haider red and white with leather falling apart at the seams steps out of an anonymous mini-cinema on wheels. In the next 4 hours new borders would emerge, invisible anti-89 boundaries propogated by the conservative controlled mono-media project and a prescribed fear of the gaijin have colonized the mind of Fortress Europe. border controls ensue. the rent-a-controllers are obviously disappointed that they had not caught the right kind of fish. some militant soccer types spit insults over the roaring engine of their camaro. 12 candidates with dutch liscense plates accelerate to blur the NL sign. why are they looking at me like that? their eyes glazed-over with Kronen Zeitung internetted fear, comfortable consensus reality glasses, we accept Euros. image is everything and i look like something they saw on TV. for all of you who thought that the borders are open in the EU, look again. it is all a matter of perspective.